We set out to do a quick relocation of the outlets in what will be our art room this weekend, and as with many ideas, it ended up going a bit differently than planned. 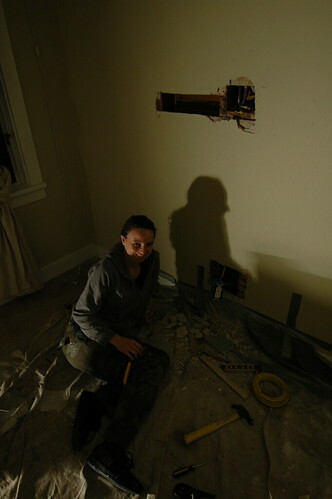 Turns out the walls are lath and plaster, and not drywall. 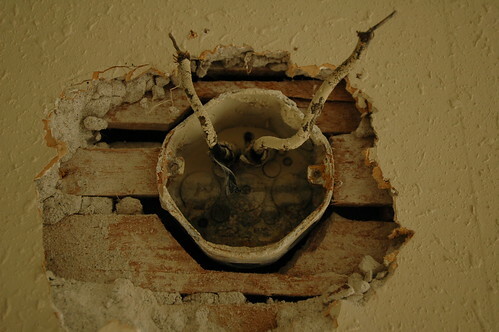 Turns out, some of the electrical boxes are just jammed into cut-to-fit holes in the lath. Turns out the reason they are all about 4' off the ground is because there are horizontal 2x4s* running between the studs at about 35" inches up. 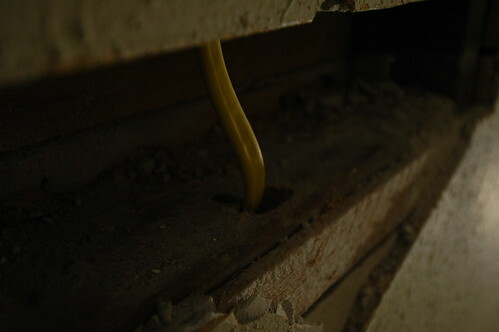 So if you want to bring wiring to the baseboards you have to not only open up a hole there for the new box, you also have to make an opening in the middle of the wall and drill through the 2x4 to route the wires down from the attic. Lath and plaster has quite bit of variation to its thickness at any given place. This makes covering the opening with wallboard it bit of a crap shoot. Some places we could just mud right, some had to be filled with plaster and built up a ways before they were anywhere near flush with the existing surface. We got two boxes in yesterday, one wired off the switch at the door which will be good for lamps (just don't plug any computers into that one). I did a third box today and we have all the holes filled that we made installing it but the wire is dangling loose in the attic. I thought I had found a later addition Romex circuit to extend from but it turned out to not be usable. This leaves me needing to splice into the existing knob & tube runs in the attic and I don't have a complete enough understanding of the wiring layout to be confident where I want to cut in yet. The runs up there are quite taught and I've never spliced into that stuff before so I need to have a think and read a bit on it. 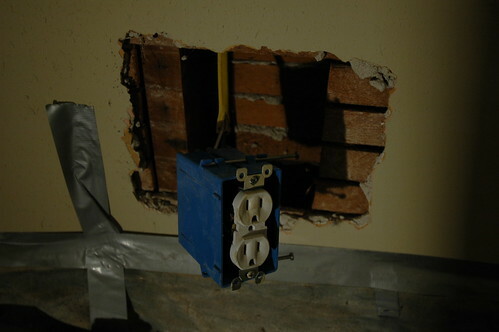 This leaves me thinking that any more rooms that get the outlet lowering might just get new runs of romex throughout, and routed all through the basement so I can skip having to drill through the fireblocks everytime I want to extend down from the attic. The couple that tests circuit voltage together, stays together.